The Question Concerning Economics - Opening Statement - ‘Walking a Thin Line’ by Uthman Ibrahim-Morrison from The Muslim Faculty on Vimeo. The first part of the module took place on the weekend of Saturday 4th and Sunday 5th of October 2014 and the second part on the weekend of Saturday 6th and Sunday 7th of December. Each weekend consisted of six lectures. 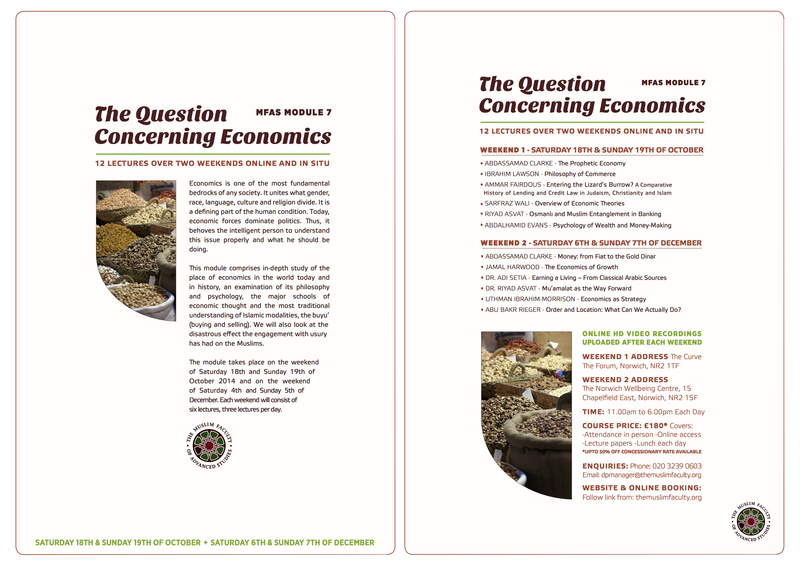 In the Question concerning Economics module, MFAS lecturers explored the thesis that economics dominates politics and drives it. For that, rather than utilising the dominant narrative that leaves us all in thrall to an outdated discipline that demonstrably underpins an inegalitarian and exploitative economic order, we need to thoroughly understand economics afresh and begin to explore new perspectives that empower us. Our course will take as its starting point the Prophetic phenomenon as the obvious beginning, in the sense of providing a grid against which to measure all phenomena in general and the economic realm in particular, as well as providing the basis for a holistic and healthy economy. We then turn our attention to the issue that will not go away: usury and its history among Jews, Christians and Muslims. This is arguably the motive force that created the need for an economic theory within the Enlightenment paradigm, rather than the moral judgement of Christianity and Judaism. Most economists arguably followed the existing practices of their society and provided a rationale for them, rather than propounding theses that the people of the world later put into practice. This lecture is an overview of the main economic theories such as those of Adam Smith, Keynes and Milton Friedman et al. Dr. Asvat explore the extraordinary history of the awqaf endowments that sustained Muslim society and many of its social welfare schemes. In particular, he looked at the cash awqaf, which some scholars accused of being usurious, and roundly defends them from that accusation, although acknowledging that in one particular mode the noble aim was achieved by a ḥīla or a legal contrivance. These awqaf were used to provide much needed capital loans to businesses and were a vital part of the commercial fabric of Ottoman society. We will then take a look at the view provided by another child of philosophy and science, psychology, and what it has to say about the condition not only of corporate man and the ‘traders’ of the stock exchange but everyman and his subservience to the dominant economic paradigm, and then the very necessary wholesome characteristics of the man of the fiṭrah and his engagement with wealth acquisition and spending, buying and selling. That is the programme for the first half of the module which was on the weekend of the 18-19th October 2014. The second half, on the weekend of the 6-7th December, will tackle some other very necessary matters and, more significantly begin to examine positive ways forward. First of all, we will address a fundamental matter: the very nature of money and its multifarious manifestations, all the way from traditional gold and silver coins through the various fiat currencies, including banknotes, digital money and Bitcoin, to the gold dinars recently minted around the world. The final part of the module consists of four lectures pointing the way forward. Well known for his extensive translations of classical source texts on mu‘āmalāt, Dr. Setia, here presents a lecture on a topic of immediate benefit to everyone: the parameters of earning a living in a way that is in harmony with the sharī‘ah. 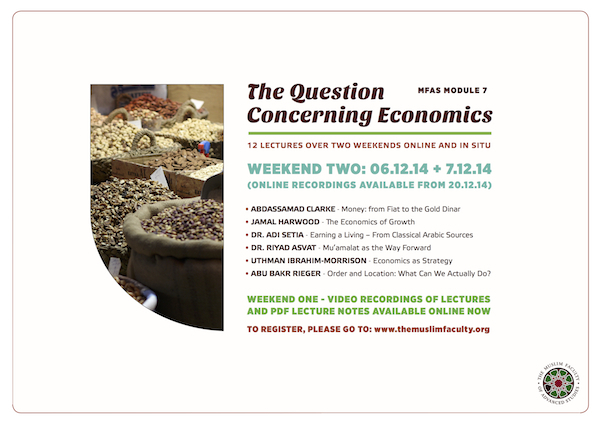 This lecture represents a more thorough treatment of the basic fiqh of commerce – employment, buying, selling, renting, borrowing, partnerships and investing – which, in the context of the foregoing, is restored to its rightful position as the actual driver of Muslim culture, since it is essentially a commercial trading civilisation. • ABU BAKR RIEGER - Order and Location: What Can We Actually Do? It falls to our last two lecturers to consider in the broadest but also the most specific terms the way before us given the picture that has been painted by our previous lecturers and the political, social and geo-political situations in which we find ourselves. It is our intention in this module to aid in laying foundations for a new nomos for the human being, both by helping in understanding the context in which we live and the history that formed it and in practical approaches to the world of commerce and earning a livelihood.